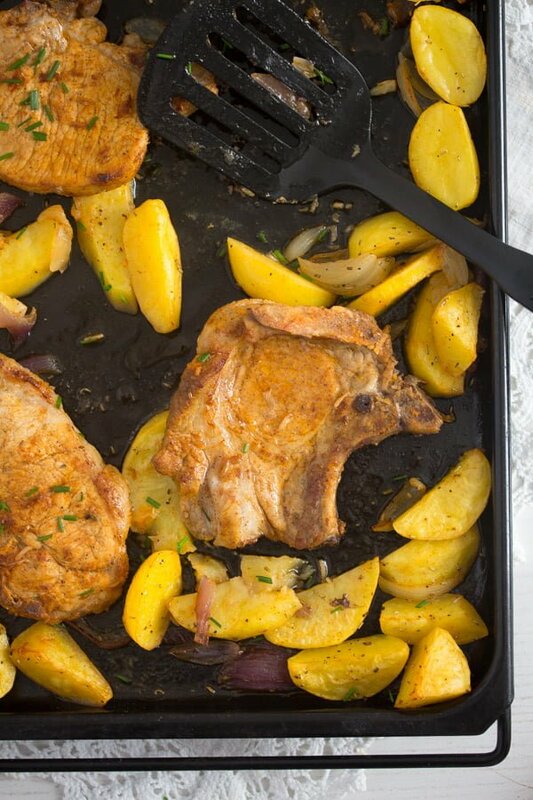 Quick and delicious: spicy oven baked pork chops and potatoes – a perfect sheet pan meal after a long and busy day. 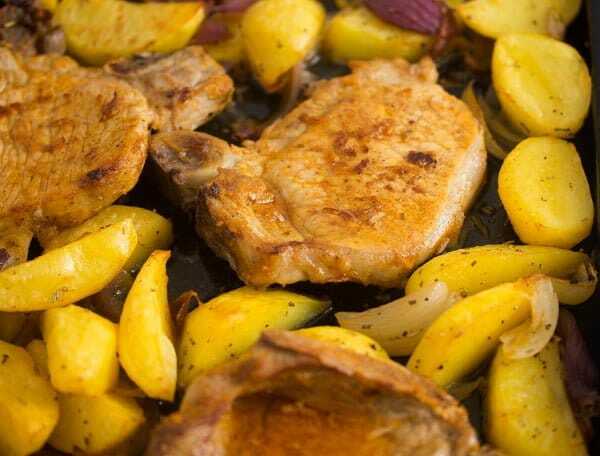 A super easy recipe for making pork chops in the oven. Rub them with spices, bake them together with the potatoes and onions and enjoy. It can’t really get any easier. 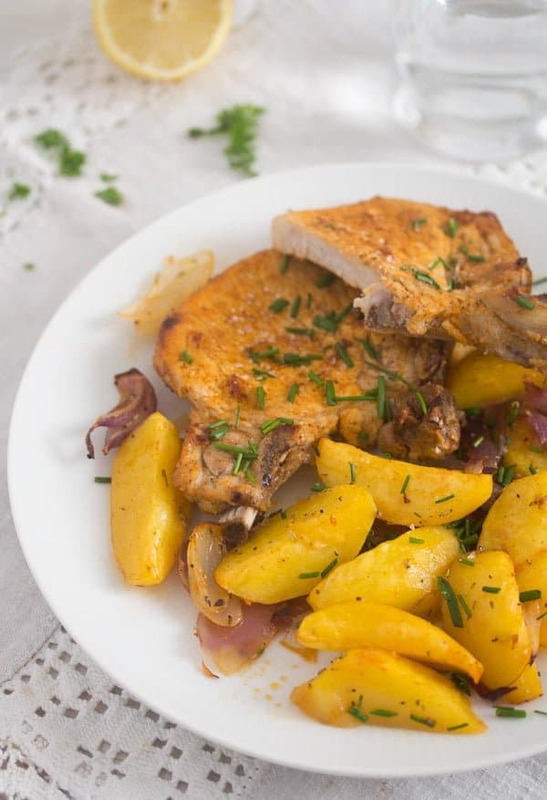 And the result are juicy, spicy and delicious oven roasted pork chops and tender roasted potatoes, which are always yummy, regardless if they are baked with or without the pork chops. 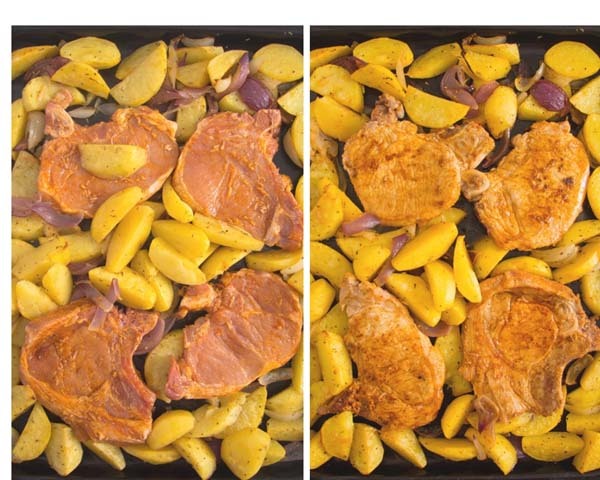 I definitely prefer bone-in pork chops to make this sheet pan meal. 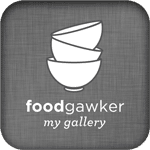 I have tried it with boneless pork chops as well (although they are more difficult to get around here) and I think the bone-in version is superior. Boneless pork chops tend to become drier, while bone-in pork chops remain juicy and nice. For a saucier recipe like the roasted pork in tomato sauce, I don’t mind using boneless pork chops, the fact that they are being cooked in so much sauce keeps them moist and tender, but for these simple oven baked pork chops I prefer the bone-in chops. When cooking pork chops you always have to consider their weight and thickness. The chops I get weigh about 200 g/ 7 oz and are about 1,2 cm/ ½ inch thick. Making a good rub for pork chops is actually pretty easy, meaning that pork chops can take just about anything. I don’t have a strict formula for making this kind of rub pork chops, sometimes I take more garlic, sometimes I go for soy sauce, sometimes I make them sweet, sometimes hot and sometimes just some salt would be enough. 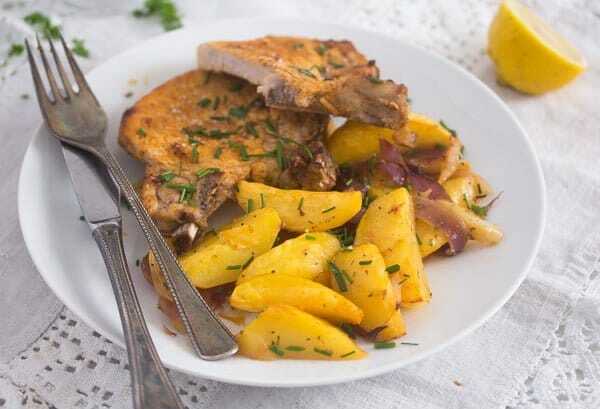 And talking about salty pork chops, you have to give this recipe from The Wednesday Chef a try, I have made it like a zillion times already and it is sooooo good! Just a pan, coarse sea salt and the pork chops. Today’s oven roasted pork chops are first rubbed with a mixture of olive oil, garlic, cumin, cayenne and paprika. To that I added a little bit of zest and juice from ½ a lime, just to make things a bit more interesting. Delicious! (By the way lemon would be fine as well, about 1 to 2 tablespoons). To ensure that the pork chops are coated in the rub all over, you can give the chops and the rub to a freezer bag, close it well and rub the chops while inside the bag. This will guarantee a perfect coating and less dirty fingers. 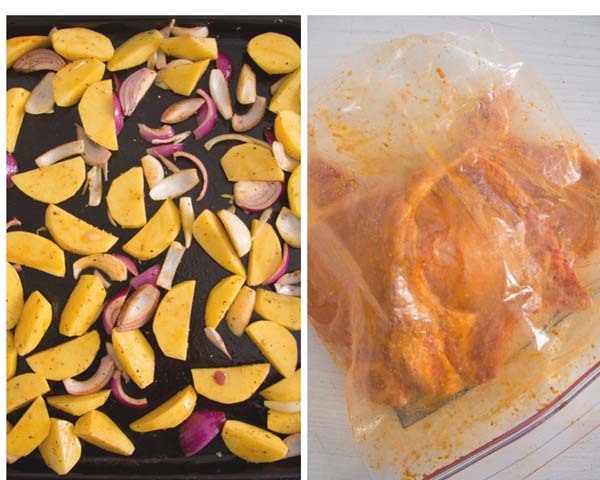 After rubbing the pork chops, make some place on the baking tray by pushing some of the potatoes and onions around. Place the chops on the tray and return the tray to the oven for another 15-20 minutes depending on the thickness of the pork chops. If you have a kitchen thermometer, you could check the internal temperature of the pork by inserting the thermometer into the thickest part of the pork chop. The internal temperature should be of about 58-62 degrees Celsius/ 136-145 degrees Fahrenheit. This temperature will make sure that the pork chops will remain juicy and slightly pink. However, if you prefer the pork chops to be cooked through, then the internal temperature should reach 66 degrees Celsius/ 150 degrees Fahrenheit. The meat will be white, but less tender than above. Do not overcook the pork chops, it is not nice chewing on a dry piece of meat! Well, you already have the potatoes and the onions and that makes dealing with side dishes for the oven baked pork chops so much easier. A fresh green salad with yogurt dressing or vinaigrette would make a great addition to the roasted potatoes. Cooked vegetables, such as broccoli, cauliflower, green beans or carrots and peas would be perfect as well. Or roasted vegetables, if your oven allows it to cook multiple trays. Oven roasted Brussels sprouts, cauliflower or carrots are my favorites. Or a mixture of roasted carrots, onions and red bell peppers. All of them coated with a little olive oil and spices of choice and baked until tender, but still retaining a bite. Clean the potatoes and peel them, if desired. Give them to a baking tray. Half or quarter the peeled red onions (depending on size) and give them to the tray as well. Pour 2 tablespoons olive oil, paprika, rosemary and some salt and pepper over the vegetables. Rub them well with your hands to coat all over with the spice and oil mixture. Arrange them on the tray in a single layer. Bake for about 15 minutes or until half cooked. In the meantime, mix together the olive oil, grated garlic cloves, cumin, chili, paprika, lime zest and juice, salt and pepper in a small bowl. Use this mixture to rub the pork chops. You can either do it with the hands in a shallow casserole dish or give the chops and the rub to a freezer bag, close it well and rub until the pork chops are evenly coated. Take the tray out of the oven. Make some place on the tray for the meat by pushing the potatoes and onions around. 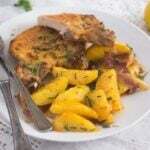 Place the pork chops there and roast for 15 to 20 minutes depending on the thickness of the pork chops. Do not overcook or the meat will be dry. To check if the meat is done (or better said still slightly pink) you can use a thermometer to check the internal temperature. Stick the thermometer into the thickest part of the chop. For a juicy and slightly pink pork chop the internal temperature should be of about 58-62 degrees Celsius/ 136-145 degrees Fahrenheit. If you like the meat well done, give it a few more minutes but do not over cook it. the internal temperature should reach 66 degrees Celsius/ 150 degrees Fahrenheit. The meat will be white, but less tender than above. Let the meat rest for about 5 minutes, then serve as suggested above. 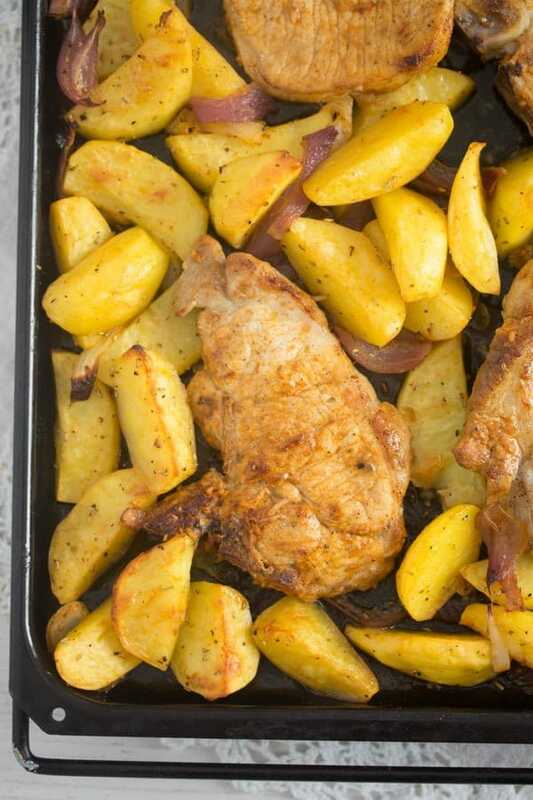 Pork and potato make a great team 🙂 This is a yummy weekday meal.